In this post I will be reviewing a new program that has just started up called the World Team Builder. I just joined it a couple days ago and am interested to see how this pans out. I have fallen out of love so to say with MLM programs but this one does seem interesting. WHAT IS WORLD TEAM BUILDER? World team builder is a new MLM program that relies on members building their teams first, before they join. This is cool, but not unique. I personally joined another program about 8 months ago that offered the same scenario and I’m sad to say it didn’t work out. Now I’m not going to sit here and say this one will fail but I am going into it very skeptical, as I think you should also. Just the fact that it is a MLM program has me concerned but seeing that it is free to join I figured why not. The goal is to have a team already in place once you are asked to join the “money” program 30 days later. What is the money program? I have no clue as they are keeping that to themselves. No big deal as you will find out in 30 days after joining and decide then if you want to join. WHATS THE GOOD POINTS OF THIS PROGRAM? WHATS THE BAD POINTS OF THIS PROGRAM? I think that this program is worth a look at by everyone. No money pout of pocket to join, build your team first then decide if you want to join.. I will see how this goes. If this doesn’t look like a scam I’ll help you build your team also. It’s hard right now to say exactly what’s going to happen, and to be honest with you I’ve had my fill of MLM programs but what the heck, let’s see how this works. 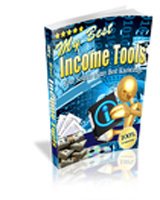 You are currently browsing the My Best Income Tools Blog blog archives for August, 2015.